I’ve told my daughter that she’s not allowed to date until she’s 25 years old, but that hasn’t stopped her from starting a collection of boyfriends at the ripe age of six. Every time I turn around, it seems she’s declaring how cute someone is, and how she’s in love with so-and-so. 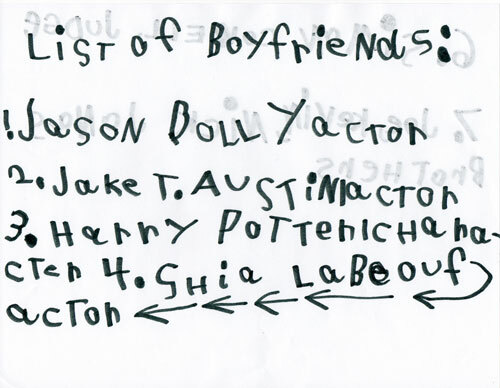 So, a couple nights ago, when we had about 15 minutes to kill before dinner, I suggested she make a list of all her boyfriends. It took her two sides of a sheet of paper. And then she flipped the page over, skipped #5, and listed a few more. Methinks I’m going to have my hands full in about 8-10 years. This is one of the cutest things I’ve ever seen (and what good taste she has)!